News of Lincoln's death by assassin reached Cleveland via telegraph at 7:30 AM on Saturday April 15, 1865. 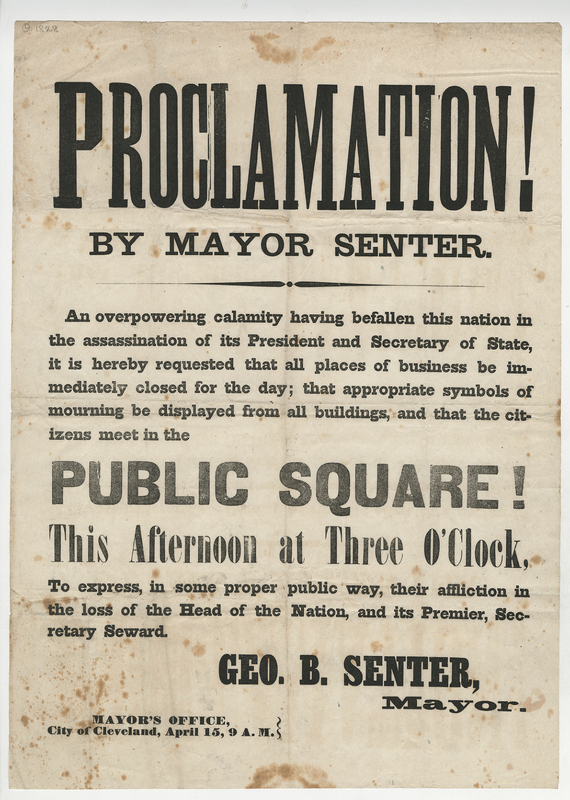 At 9:00 AM Mayor George B. Senter issued a proclamation to the citizens of Cleveland announcing the "overpowering calamity that has befallen this nation." He asked that all businesses be closed and that all citizens gather on Public Square that afternoon at 3 PM to mourn "the loss of the head of our nation, and its Premiere, Secretary Steward." Steward would survive his attack. Senter had been mayor in 1861 when Lincoln had visited on his way to his inauguration. Less than two weeks later, Public Square would be the site of another gathering of citizens to view the body of the slain President. Permission for personal and research use; publication or reproduction requires written permission from the Western Reserve Historical Society.